Radon, 222Rn, a radioactive, colourless and odourless gas with a half-life of 3.82 days is the largest source of radiation exposure for most of the UK population and is the second highest cause of lung cancer after smoking (Darby et al, 2005). Public Health England (PHE) reviewed the potential public health impact of possible chemical and radiological pollutants resulting from shale gas activities in 2014 (PHE-CRCE-009). The PHE review recognised that radon would be released to air but expected this to be at low level. PHE could not envisage a plausible mechanism in which shale gas extraction processes could significantly change radon entering properties from the ground but also recognised that people might measure radon in their home after such activities start and mis-attribute any high levels to the shale gas activities rather than from existing natural sources. Radon measurement in outdoor air and in homes was recommended to assess the baseline and provide evidence on radon distributions before shale gas extraction commenced. The Vale of Pickering is an area which has been selected for shale gas extraction. Whilst the majority of the Vale does not have naturally elevated radon potential, there are areas of naturally elevated radon potential called Radon Affected Areas, at around 5 to 8 km to the north and south of the shale gas exploration site (KM8). In Radon Affected Areas, at least 1% of homes are expected to have radon levels at or above the UK Action Level of 200 Bq/m3. To determine the effect (if any) of shale gas extraction on levels of radon, baseline monitoring of radon levels within these radon Affected Areas as well as outside Affected Areas is required prior to commencement of shale gas extraction in order to compare with results at the same locations after shale gas extraction has begun. PHE has been monitoring indoor and outdoor radon levels at various locations in the Vale of Pickering since October 2015. The results of the monitoring from October 2016 to December 2017 are included in this report. Earlier data are reported in the Phase 2 report (Ward et al, 2017). Indoor radon concentrations exhibit diurnal, monthly and seasonal variation (Miles and Algar, 1988), thus long term testing gives a better estimate of the annual average radon concentration. PHE has recruited householders who have agreed to receive standard packs of passive detectors by post for several consecutive periods of 3 months. In addition each home has been issued a further two passive detectors for householders to carry out monitoring over a longer period of up to a year. Some 133 properties in the Vale of Pickering were included in the third phase of the monitoring from April 2017 to March 2018. Measurements in this study follow the PHE Validation scheme (Howarth C B and Miles J C H, 2008) for handling, placement and reporting of results for homes. Outdoor radon levels have been assessed using passive radon monitors very similar to those used routinely in homes. The detectors have been placed in small aluminium-wrapped weatherproof plastic pots in discreet but open-air positions for several consecutive periods of 3 months or longer in a number of locations in the Vale of Pickering and also around Oxfordshire (acting as a control) to measure the radon concentrations in the open air. An active radon monitor (AlphaGUARD) and passive detectors were placed in the air quality monitoring instrument enclosure at the KM8 site to assess the short term variation and long term average radon concentration at the site. Four areas were selected for indoor radon monitoring in the Vale of Pickering: Kirby Misperton and Little Barugh, Yedingham, Pickering and Malton. Pickering and Malton are both areas of established elevated radon potential. Results from the four 3-month tests covering the period from December 2016 to December 2017 are presented in Table 22. The annual average radon concentrations were calculated employing seasonal correction factors as outlined in the PHE Validation scheme (Howarth and Miles, 2008). The distribution parameters assuming log-normality confirm that homes in Kirby Misperton and Little Barugh are situated in areas with low radon potential while Pickering is situated in an area with higher radon potential (a Radon Affected Area). 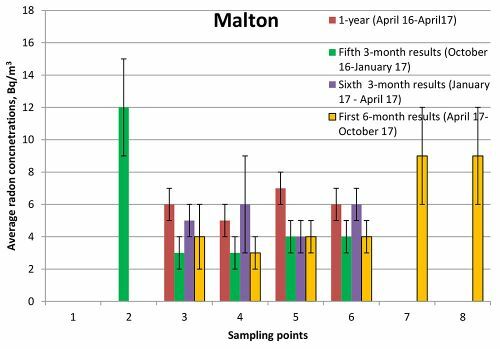 For Malton, the probability assessment was inconclusive due to a reduced statistical power; results from only a dozen properties were available. Malton is classified as a Radon Affected Area from previous studies (Miles et al, HPA-RPD-033, 2007). The monitoring identified that a single result for the period June to September 2017 for one house in Yedingham (an area with low radon potential) was above the UK radon Action Level of 200 Bq/m3. The results for the same house were below the Action Level for all other periods including the eighth 3-month period. It should be noted that there is a small possibility of houses having radon levels above the UK radon Action Level even when they are in the lowest radon probability areas. Year-to-year variability of indoor radon of up to 40 % has also been observed (Hunter et al, 2005). Table 22 Range and distribution of estimated annual average indoor radon measurements from December 2016 to December 2017. Seasonality of indoor radon was studied using the eight 3-month consecutive measurements in each home, without seasonal correction. Data were only included from the 73 homes where results were available for all of the measurement periods (November/December 2015 to December 2017). The average radon concentrations were calculated by combining the results for homes in each of the areas of Kirby Misperton and Little Barugh (KM-LB), Yedingham, Pickering and Malton for each of the measurement periods. The results are presented in Figure 92. From the plot it is evident that homes in Kirby Misperton and Little Barugh, and also in Yedingham showed rather small seasonal variation. The seasonality in Pickering in contrast is well pronounced as it is in an area with elevated indoor radon concentrations (radon Affected Area), however all areas follow the normal UK seasonal pattern with a minimum in summer and maximum in winter (Miles et al, 2012). The number of results for Malton is rather small (see Table 22) compared to the other areas where results were assessed and hence the uncertainty in the results is higher. It should be noted that the average values for each 3 month measurement period for the first year (November/December 2015 to December 2016) show good agreement with the values for the second year (December 2016 to December 2017). Figure 92 Seasonal variation of average indoor radon concentrations in the area of Kirby Misperton (KM_LB) and Little Barugh, Yedingham, Pickering and Malton 8. Four sites were selected for outdoor radon monitoring in the Vale of Pickering around Kirby Misperton (the area closest to the KM8 site), Yedingham (control site), Pickering and Malton (sites in Radon Affected Areas). One site in Oxfordshire was selected as an additional control. Four 3-month and two 1-year passive detectors were used to record radon concentrations at each monitoring point. 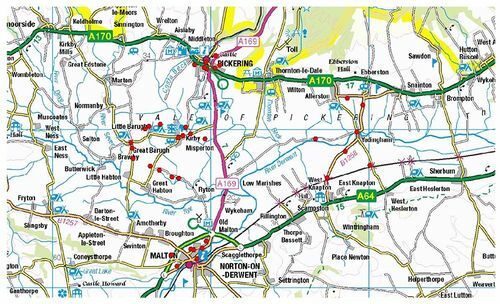 The locations of the monitoring points in the Vale of Pickering are shown in Figure 93. The 3-month monitoring period in the Vale of Pickering was replaced by a 6-month monitoring period in April 2017. The results from the second year of monitoring (fifth 3-month, sixth 3-month and first 6-month monitoring periods) were plotted and compared with the result obtained from the 1-year test (October 2015 to October 2016), where these are available. The information for each sampling point in the area around Kirby Misperton, Yedingham (control area), Pickering and Malton are shown in Figure 94 to Figure 98, respectively. The results for each detector at each location for each period were averaged and plotted. It was not possible to obtain results for all sites as some of the detectors were removed or damaged during the measurement period due to vandalism. This was most evident in the Malton area. Some sites where this damage occurred early on in the programme were re-located; for these monitoring points the 1-year monitoring results were not available. Figure 93 Outdoor radon sampling points in the Vale of Pickering. © Crown Copyright and/or database right, 2018. Licence number 100021290 EUL. The results from the control area in Oxfordshire are shown in Figure 98. The points were located in private gardens. Monitoring was carried out for 15 months from October 2015 to January 2017. In January 2017 one participant left while 3 new participants joined the programme. Where available the averaged results from the four 3-month monitoring periods at each sampling point in the control area from January 2017 to January 2018, were plotted and compared with the 1-year test carried out previously from October 2015 to October 2016. Figure 94 Average radon concentrations at the sampling points around Kirby Misperton. Figure 95 Average radon concentrations at the sampling points around Yedingham. Figure 96 Average radon concentrations at the sampling points around Pickering. Figure 97 Average radon concentrations at the sampling points around Malton. Figure 98 Average radon concentrations at the sampling points in Oxfordshire. 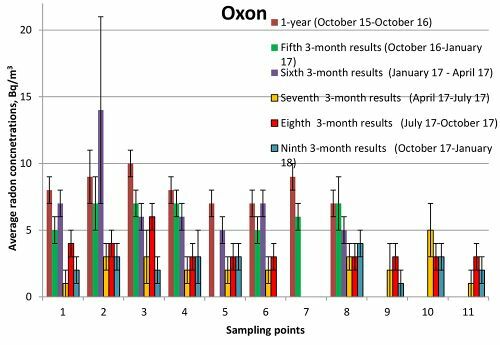 Seasonal variation of outdoor radon was studied using 3-month consecutive measurements over two consecutive years. The average radon concentrations were calculated for the areas around Kirby Misperton and Little Barugh (15 sampling points) and for Oxfordshire where 8 sampling points monitored from October 2015 to April 2017 and 7 sampling points monitored from April 2017 to January 2018. The data for the other areas were not used because various sampling points were moved or lost due to vandalism and a consistent set was not available, the results are shown in Figure 99. From the data it is evident that the patterns of outdoor radon in the two areas, which are situated in different parts of England, are very similar. There are also indications that the seasonal pattern of outdoor radon is different to that observed for the indoor radon results for the same periods, with results in the summer (April 2016 to July 2016) being higher than the results in spring (April 2016 to July 2016) and autumn (October 2016 to January 2017). The factors affecting radon concentrations outdoors are different to those indoors. Outdoors the concentrations are likely to be linked to environmental factors. Indoor levels are influenced by human lifestyle factors such as heating and ventilation of the home in addition to environmental factors. It is not surprising that the seasonal pattern for radon is different for indoor compared to outdoor concentrations. The seasonality was studied further with data for Oxfordshire only; the monitoring in Yorkshire was changed to 6-month periods from April 2017. 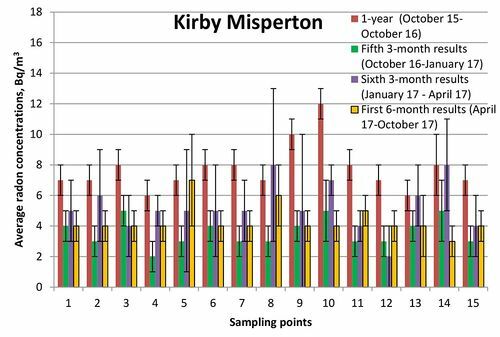 In Figure 99, which presents values at 3-month intervals, the 6-month monitoring period from April 2017 to October 2017 for Kirby Misperton is presented as two points with the same value. 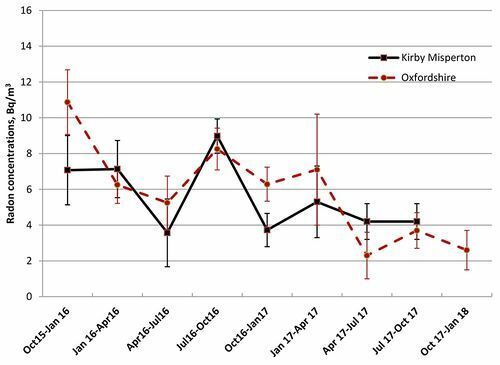 The outdoor radon levels in both Kirby Misperton and in the control area of Oxfordshire were approximately halved in the second year (October 2016 to October 2017) compared to the first year of monitoring (October 2015 to October 2016). This indicates a potential year-to-year variability of outdoor radon. Figure 99 Seasonal variation of outdoor radon concentrations in the area of Kirby Misperton and Oxfordshire. The data from the AlphaGUARD continual radon monitoring instrument, placed in the enclosure at the KM8 site for the six 3-month periods between April 2016 and October 2017 were analysed. The inherent background of the instrument of 3 Bq/m3, resulting from the longer half-life alpha emitting radionuclides (from environmental exposure and materials within the instrument), was taken into account when data were processed. The radon data, taken at 1 hour intervals, are log-normally distributed. The distribution parameters for the above monitoring periods are given in Table 23. The average radon concentrations measured over the six monitoring periods were in the range 4 to 6 Bq/m3. In order for a comparison to be made between the outdoor radon concentrations measured with the instrument and the other outdoor results, passive monitors were also placed in the enclosure at the KM8 site. with AlphaGUARD and passive detectors in the KM8 enclosure. The average radon concentrations measured using 10 passive detectors are similar to the arithmetic means (AM) of the distributions measured with the AlphaGUARD for these periods as shown in Table 23. This demonstrates a good agreement between the two different measurement techniques. A graph showing the raw data obtained from the AlphaGUARD, without background correction, is given in Figure 100. No data were collected for a short period in July 2016 when the instrument was removed and returned to PHE Chilton for downloading of data. Year to year variation of indoor radon was studied with measurements from 73 homes where results were available for all eight measurement periods. The indoor radon levels did not show any obvious difference between the first year (November/December 2015–December 2016) and the second year (December 2016–December 2017) of monitoring (see Figure 92). The seasonal and annual variation of outdoor radon concentrations were studied in the area of Kirby Misperton and in the control area in Oxfordshire. The results presented in Figure 99 displayed a difference between the radon levels measured in the first year (October 2015 to October 2016) and the second year of monitoring (October 2016 to October 2017). This is an indication of a year-to-year variability of outdoor radon. Figure 100 Time series of radon concentrations recorded by AlphaGUARD between April 2016 and October 2017. The analysis of the results for 133 homes measured in the Vale of Pickering showed distributions of indoor radon concentrations consistent with the usual log-normal distribution for indoor radon. The results for Kirby Misperton and Little Barugh area are consistent with their status as not being Radon Affected Areas. 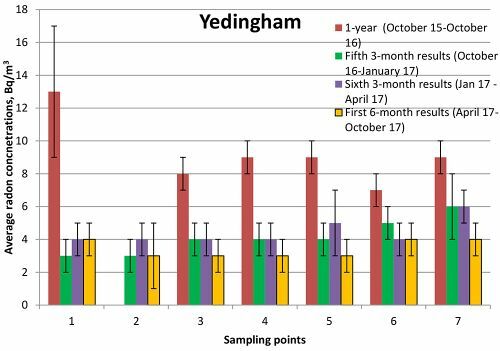 Results for Yedingham (an area with low radon potential) are also below the Action Level with the exception of one result for the seventh 3-month period which was measured at 240 Bq/m3. This result demonstrates the variability of radon when measured over a period. We are aware that year-to-year variability of indoor radon of up to 40% (Hunter et al, 2005) is possible. The other results for this house including the annual average radon results for the eighth 3-month period are lower and below the UK radon Action Level of 200 Bq/m3. The results for Pickering confirmed the prior status as a radon Affected Area with radon concentrations spread over a wider range from about 10 to 450 Bq/m3 and several homes were found to have results exceeding the Action Level. Each householder was given standard advice on any action required; those with high radon levels were given additional information on reducing their radon concentrations. Radon levels above 200 Bq/m3 were measured in homes in Malton at the beginning of this study which confirmed our classification as a Radon Affected Area; standard advice to reduce radon levels were issued to these homes. Due to the reduction in available results as householders withdrew from the study over time, the statistical power was also reduced. Hence the probability assessment for December 2016 to December 2017 was inconclusive. To increase the sample for this area, 100 householders were contacted by post and invited to take part in the monitoring. As a result of this mailshot, a further 17 householders in Malton agreed to take part and PHE standard packs of passive detectors were sent to them by post in November 2017. Seasonal variation of indoor radon was also studied for all areas. Results indicated that there is little seasonal variation in measurements made in homes in the areas of Kirby Misperton and Little Barugh, and in Yedingham. 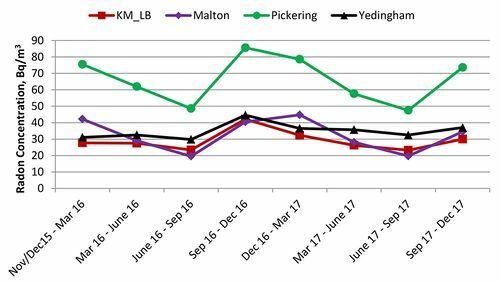 The seasonal variation observed in Pickering was higher, although this may be linked to better statistics (larger sample size and a higher average radon level). All areas follow the normal seasonal pattern in the UK with the highest radon concentrations in winter and lowest radon concentrations in summer. It should be noted that the number of results for Malton is rather small (see Table 22) compared to the other areas where results were assessed. 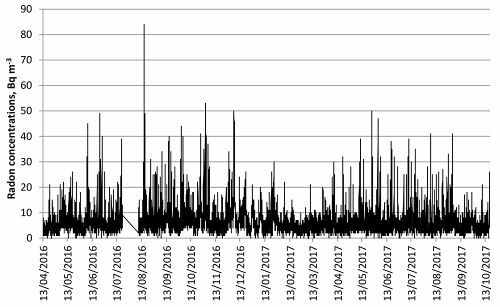 The results from the first year of monitoring (October 2015 to October 2016) of 3-month back to back measurements of outdoor air are about 1.5 times higher than the radon concentrations observed previously in the UK of 4 Bq/m3 (Wrixon et al). In contrast the results from the second year of the monitoring (October 2016 to October 2017) indicated levels closer to those previously measured. There is no indication of elevated outdoor radon concentrations in the Pickering or Malton Radon Affected Areas. The analysis of results for another control site in Oxfordshire showed similar concentrations. Seasonal variation of outdoor radon was studied for areas around Kirby Misperton and Oxfordshire. Results showed similar patterns in these geographically distant areas. The study of seasonal variation of outdoor radon is continuing using 3-month back to back measurements in Oxfordshire. Results from an AlphaGUARD active monitor and passive detectors, placed in the KM8 enclosure are in good agreement with the average outdoor radon in the area of Kirby Misperton. The active monitoring showed significant variations over time, however the annual average measured at the KM8 site was consistent whichever of the techniques was used. ↑ Darby S, Hill D, Auvinen A, Barros-Dios J M, Baysson H, and Bochicchio F, et al. 2005. Radon in homes and risk of lung cancer: collaborative analysis of individual data from 13 European case-control studies. BMJ, 330:223. ↑ Ward R S, Smedley P L, and Allen G, et al. 2017. Environmental Baslein Monitoring Project: Phase II — Final Report. Report of the British Geological Survey. OR/17/049. http://nora.nerc.ac.uk/id/eprint/517889/. ↑ Miles J C H, and Algar R A. 1988. Variations in radon-222 concentrations. Journal of Radiological Protection 8 (2), 103–106. ↑ Miles, J C H, Appleton, J D, Rees, D M, Green, B M R, Adam, K A M, Myers, A H. 2007. Indicative Atlas of Radon in England and Wales, Chilton, HPA-RPD-033. ↑ 6.0 6.1 Hunter, N, Howarth, C B, Miles, J C H, Muirhead, C R. 2005. Year-to-year variations in radon levels in a sample of UK houses with the same occupants. Seventh International Symposium on the Natural Radiation Environment (NRE-VII). In: Radioactivity in the Environment Book Series, Vol. 7. Elsevier, 438–447. ↑ Wrixon, A D, Green, B M R, Lomas, P R, Miles, J C H, Cliff, K D, Francis, E A, Driscoll, C M H, James, A C, and O’Riordan, M C. 1988. Natural Radiation Exposure in UK Dwellings. Chilton, NRPB-R190.